With the highest quality, non-ghosting dry-erase laminate on the market, a well-equipped panel processing facility, and years of experience with dry-erase laminates and panels, Richwood is the source for your dry-erase needs. We offer regular and magnetic laminates, one and two-sided markerboards, as well as custom markerboard solutions. Our markerboard panels have been specified by office furniture industry leaders and can be found in applications across the contract furniture industry. Please see below for detailed information on our standard products. 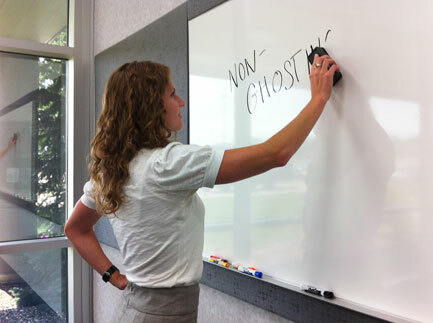 High quality non-ghosting dry-erase HPL. High quality non-ghosting dry-erase HPL with magnetic strength. Non-ghosting dry-erase face with a 9/16" MDF core. Non-ghosting dry-erase surface on both sides of a 1/4" MDF core. 616-243-2700 | All rights reserved.